Oskar Blues Brewery, Lyons CO - The southern / southeastern connection. Dale shows off his canning line. "We've turned Dale's wacky, inspired idea into something very special - something that has changed the craft beer landscape in a growing and significant way." -- Marty Jones. Oskar Blues Brewery opened in 1997 in the small, sleepy town of Lyons, Colorado (population: 1500) and evolved into a brewpub in 1999. Today the popular spot plays host to some of the nation's best beers, live Blues, and southern and Cajun-inspired foods that reflect owner Dale Katechis' southern roots. The owners and almost every department head of the brewery hail from the South. Dale Katechis, his brother Chris and their office manager (and mother) Ya Ya are all from Alabama. Sales manager Wayne Anderson grew up in LaGrange, Georgia. Publicity director, idea man and lead singer, Marty Jones comes from Virginia. Marty Jones told SBN, "Oskar Blues brings many qualities from the South that mesh quite well with the Rocky Mountain region. Long ago in a review I wrote of Oskar Blues, I described the place's intensely southern-style hospitality and vibe. The description sticks today. Obviously the brewery bears the heavy southern stamp through Dale's Alabama origins and heritage, and the stamp is there in the food, the immense sense of southern hospitality, the southern folk art, and the music. It's all over the place." You add in the same southern sensibilities from Ya Ya, Wayne, Chris, Marty and many other expatriated southerners who work and hang out at the brewpub, and the southern ambience of Oskar Blues gets even heavier. "Plus, Lyons is a true small-town, much like so many other small towns back home in the South. Folks know each other here, look out for each other and sometimes even gossip about each other," remarked Marty Jones. Wayne (marketing guy) and Dave (brewer) in the brewhouse. The split-level brewpub includes an upstairs, family-oriented restaurant and a funky, Bluesy, bohemian bar and music hall on the lower floor. Oskar Blues welcomes Lyons and Boulder locals and visitors from across the nation and globe -- many of them headed for nearby Rocky Mountain National Park and the other high country treasures of the surrounding area. The brewpub's mouth-watering menu includes Cajun, Creole and southern-style comfort foods. Oskar Blues' lineup of rich, scrumptious entrees is sure to satisfy any robust appetite. Visitors choose from authentic gumbo and other New Orleans-style treats, fried catfish, crabcakes, blackened redfish, beans and rice, burgers and pizza. Marty Jones signed on with Oskar Blues in September of 2002, and helped Dale launch what they call "The Canned Beer Apocalypse" in November of the same year. Marty recalls, "Dale contacted me and told me he had a crazy idea about hand-canning his pale ale as a way of drawing attention to the brewpub and getting packaged beer into the local market place. I loved the idea, thought it was brilliant and totally blasphemous, and signed on to help him get the word out to the press. Dale and the Oskar Blues crew installed their first hand-canning line back in 2002 in the 60-year-old barn next door to the brewpub. We've turned Dale's wacky, inspired idea into something very special -- something that has changed the craft beer landscape in a growing and significant way." Oskar Blues' sales manager, Wayne Anderson, remarked, "The can quickly distinguished our beers and brewery from other products out there. Being the first microbrewer to can its beer really stamped us as unique. And it helped that we were an outfit of crazy southerners who didn't care if people thought we were nuts. We became believers in the can and ignored the nay-sayers who told us that nobody would buy craft beer in a can." The can itself even seems to have a connection to the South with its working-class utility, outdoor portability, and its total lack of pretension. "Where I come from, you don't go fishing without beer in the cooler. Our canned beers have totally added a motherlode of flavor to this tradition. Our canned craft beers continue to offend folks here and around the US who see them as low-brow, but we don't make dumb, watered-down beers for the lowest common denominator. We make otherworldly beers for discerning drinkers. Southern folks know life is awfully short and requires the best food, music, beer and company in order to make the most of our time here," explained Marty Jones. "We thought the idea of our big, hoppy beer in a can was funny -- no one was doing it at the time, and it caught the market by surprise," Dale Katechis remarked. "We love surprising people by showing them that a great beer can come from a can -- we filled a certain hole in the market and people realized 'this dog will hunt,' as they say in the South." Katechis and his crew soon discovered other benefits to cans. "Modern, plastic-lined cans are advantageous for beer," he says. "They keep beer especially fresh by fully blocking light, and cans have the lowest amounts of dissolved oxygen. Cans are also easy to recycle and take less fuel to ship." Oskar Blues beers are now sold in 18 different states. Dale Katechis is proud of this fact, but frustrated that Alabama's outdated, restrictive alcohol limits on beer prohibit any of the Oskar Blues beers from being sold in that state. "If there's a place we'd really like to sell beer, it's back home in Alabama. There's a huge growing market in the Southeast for microbrews, and I think Alabama offers great potential for our beers. I hope the Free the Hops movement is successful there soon," said Dale. In 2006 Oskar Blues earned the rank of largest-producing US brewpub. Today it's one of the fastest-growing craft breweries in America. Since launching its canning effort, the brewery's production has grown by almost 1300%. In 2007 the brewery produced 14,000 bbls of beer, up about 110% from 2006. In 2007 Oskar Blues expanded its brewhouse for the fourth time in four years -- replacing its four 60-bbl fermenters with four new 120-bbl fermenters. A new 35,000 square foot facility equipped with a new 50 bbl brewhouse was constructed in Longmont (about ten miles from Lyons) and begins production of the company's four main beers in January of 2008. 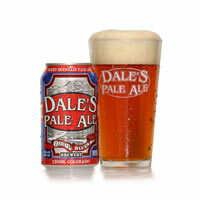 Dale's Pale Ale is a robust American pale ale (with 6.5% abv and 65 IBUs). Known for its elegant hop aroma and flavor, Dale's flavor profile is backed up by a rich maltiness. 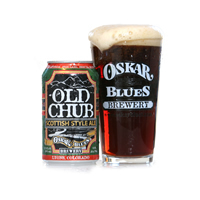 Old Chub Scottish Style Ale is a strong Scotch ale that comes in at 8% abv. Brewed with five different malts (including beechwood-smoked malts from Germany), Old Chub is a warming beer that is great with vanilla ice cream. At 8.7% abv and 85 IBUs, Gordon is a hoppy, potent ale somewhere between an Imperial IPA and a double red ale. It's made with six different malts and three types of hops, including a huge, aromatic dry-hop addition. 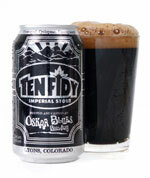 The newest canned product from Oskar Blues is the 10.5% abv imperial stout that is amusingly called Ten Fidy. Look for very small quantities of this jet black, roasty, viscous ale (packaged in stylish black and silver cans) to be shipped to the Georgia market over the late winter months. Outside of Colorado, Georgia is tops in sales for the Oskar Blues beers. Georgia sales manager, Kerri Allen, said, "Our beers are delicious, consistent and compete well with the many microbrews in the state. The owners being from the South has played a big part in helping these guys make a connection to the southern market. In trying to get new places to stock our beers, it's often a deciding factor for some bars that Oskar Blues is owned and operated by a southern family. There's a sense of connection, and we southerners do like our connections."